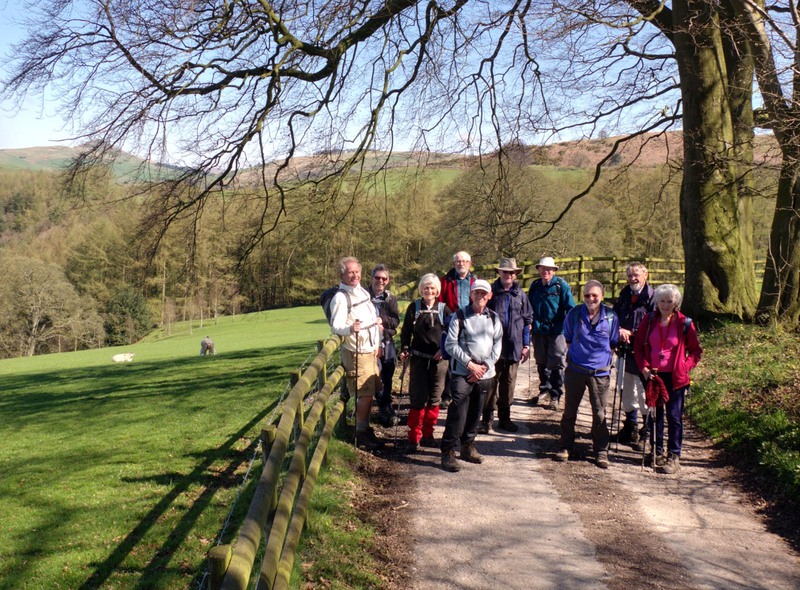 Our walk on April 18th started at Danebridge, from where the party of eleven walkers set off in glorious sunshine to the Ship Inn, then following a footpath passed Wincle Grange, towards Dumkins. High overhead, we spotted two buzzards circling effortlessly. As we gained height, we enjoyed spectacular views, with the countryside opening up all around. Rolling hillsides were revealed, covered in many shades of fresh green vegetation, all lit up in the bright Spring sunshine. We descended to Whitelees Farm and had morning coffee break beside the River Dane, glimpsing the occasional yellow flash of busy grey wagtails. Our route ascended from the valley once more, passing Bearda Mill, with its old water wheel visible from the road. As we crested the hill we were surprised to see a bust of Karl Marx staring down at us from an open barn window. 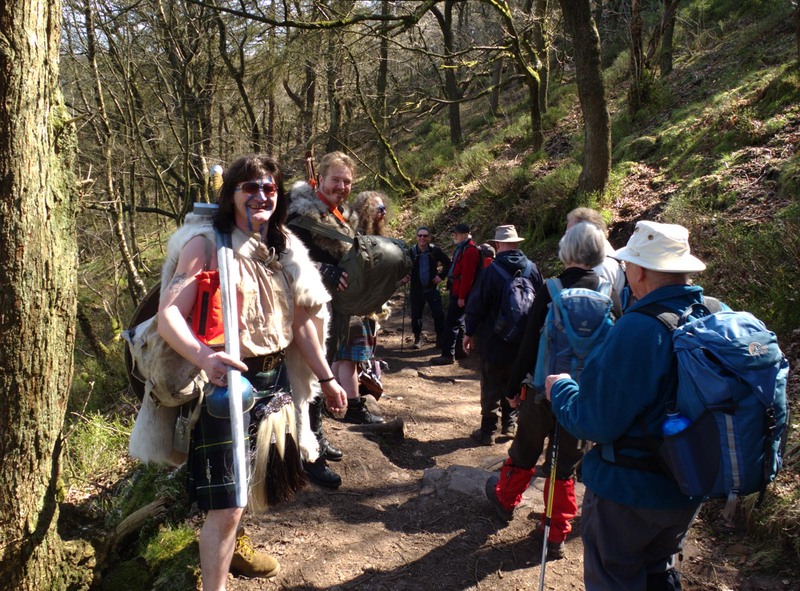 The dramatic Hanging Stone was our next waypoint, and on the descent through woodland our party was amazed to come upon a group of kilted Scottish warriors, en-route to battle, complete with faces painted – Braveheart style – with blue woad. We crossed the River Dane once more to pass the former Youth Hotel at Gradbach, shortly before lunch. 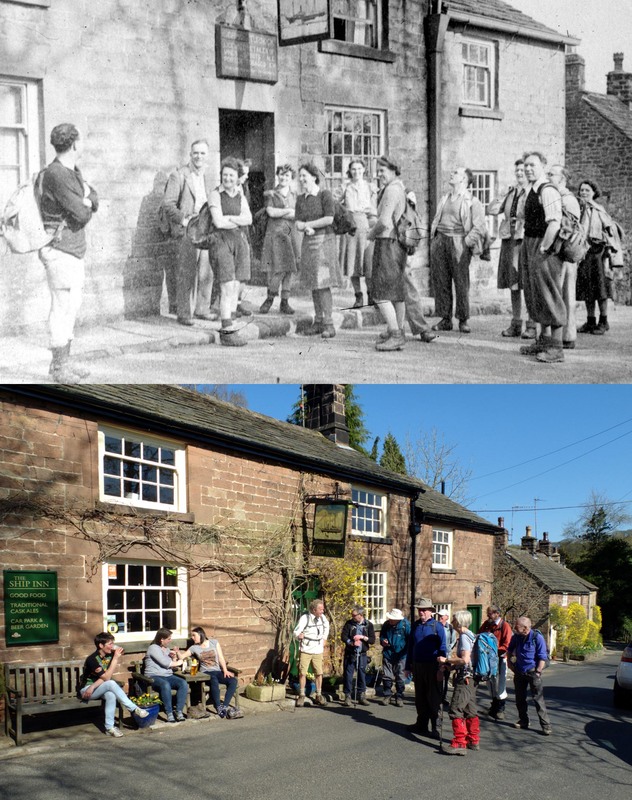 The afternoon saw us visit the picturesque Three Shires Head, where the boundaries of Cheshire, Staffordshire and Derbyshire meet, before traversing the moorlands leading to Wildboarclough. After another waterside coffeebreak we crossed Hammerton Moss before returning via Wincle to the start point, having covered a total of 13 miles.